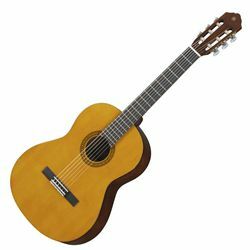 The Yamaha CS40II Compact Nylon String Classical Guitar is designed specifically for young learners with a shorter scale and compact body to offer improved playing comfort. The guitar features a 22.8" scale, spruce top with meranti back and sides, a nato neck with a rosewood fingerboard, rosewood bridge, and a gloss finish. It is designed to serve as an affordable, yet high-quality 7/8 size starter guitar.